2. Select Paintbrush and draw something on canvas. 3. Click Layer | New Layer. 5. File | Save as and save the file into PNG file type. 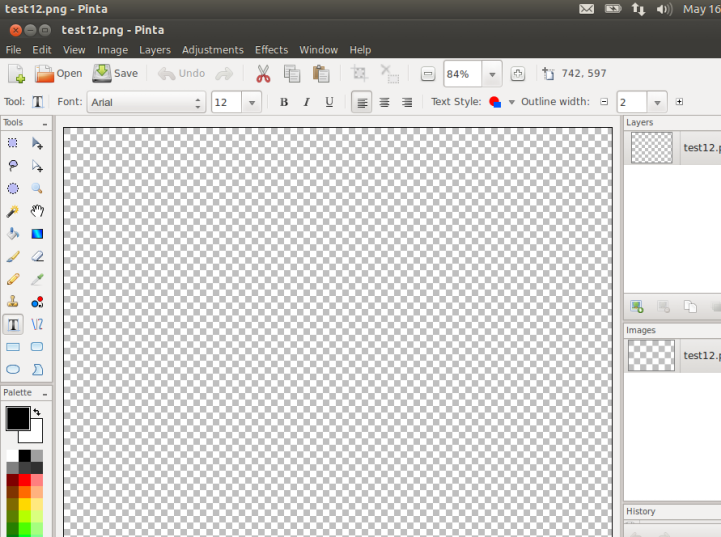 Close the file and open it again, you will notice that only blank (without "test" text) transparent layer is displayed. P.S. I have tested this in Pinta v1.3 on Windows XP and it works fine. It looks like a regression to me. This bug was already in Pinta few years ago and was fixed. Now bug reappeared. I have tested several revisions from github and I see a regression appeared in commit: "Add a 'Copy Merged' command, which copies the flattened image/selecti..." which is revision: aefe1ccd1a4d25562d67247f7ecfe8222322454c from May 14, 2012. I can't seem to reproduce this with the latest development build on 12.04 - saving appears to work fine for me. Cameron saving is working fine. Opening saved file is a problem. When such a file is opened only "transparent layer" is displayed (without text on it). See attachment. I have tried this one more time and actually I have found out that the first revision this problem appears in is "Make "Flatten Image" and "Merge Layer Down" respect blend modes" witch is revision number: f0fddbd10d133ec8ad97e0129511f4e656337474 from May 14, 2012. I can reproduce this now on Ubuntu 12.04 with latest development build. Closed my dupe of this bug and bumped the priority on this one since being able to save is failry mission-critical. From my comments:" Every PNG image I saved was completely blank, and every JPG was completely black. ORA images saved fine. " Verified that the problem appeared in that commit. The funny thing is, I can't see anything obviously wrong with the code. I suspect that GetFlattenedImage() does something that is incompatible with the saving procedure, but not sure what. Update: I found out that putting a breakpoint on  triggered plenty of times after reverting to a working state, but none at all in the current state. So the condition there is not being triggered anymore, seemingly meaning the alpha value is always set to 0. I tried commenting out the if clause, and saved files are still broken, so there probably is something wrong with the alpha value on the imagesurface being handed to it from GetFlattenedImage(). More exciting debugger action! The place where it seems to go wrong is in ImageSurface.Clone (). After stepping through there with a small image, I noticed that the cloned surface being returned is completely empty. Why this is doing that I don't know, since this method hasn't been changed. In case there is a specific reason it was done this way before or anyone sees a reason why the new way is worse (performance?) I uploaded it as a pull request rather than commiting directly. Anyone have any thoughts on this? Should have been "the data array is just directly copied over" in the previous comment. Tested on latest development and problem is solved. Thanks. I've held off on closing this one because we weren't sure about how solid the fix was, I just pushed a revised fix. If that's good then we'll close. I verified the change on Ubuntu 12.04 and Window 8, so I'll mark this as committed. I tested this bug in pinta-1.4-preview-20120812 on Windows XP and I can report this is fixed. Thanks a lot! Pinta v1.4 on Windows XP. Problem solved.